The neural crest, the last frontier of stemness and pluripotency of the developing vertebrate embryo, is maintained purposefully and distinctly by SoxE transcription factors. Why This Is Cool – This story is fundamental developmental biology at it’s finest. The authors set out to answer a seemingly facile question – as development progresses, why does the vertebrate embryo switch between different transcriptions factors that seem to do the same thing? SoxB1 transcription factors (Sox1-3) maintain the stem cell state in the early blastula and in embryonic stem cells. As the embryo transitions to being more defined and differentiated, the neural crest cells represent one of the last cell populations holding onto a stem cell-like state and pluripotency. Though neural crest cells and blastula cells have many similarities, they express different Sox transcription factors, with the neural crest transitioning to expressing SoxE factors (Sox8-10). The authors demonstrate this through a beautiful sequence of in situs of Xenopus embryos where you can see the gradual restriction of Sox2&3expression to the neural plate, while Sox9&10 becomes upregulated specifically in the neural crest (Figure1). Figure 1. Expression of SoxB1 and SoxE factors in Xenopus embryos. (A) In situ hybridization examining Sox2 and Sox3 expression in wildtype Xenopus embryos collected between blastula and late neurula stages. (B) In situ hybridization examining Sox8, Sox9, and Sox10 expression in wildtype Xenopus embryos collected between blastula and late neurula stages. The authors then complete a series of in vivo rescue experiments and functional differentiation experiments to test what redundancy or specificity exists between the SoxB1 and SoxE factors. First, early expression of SoxE in the blastula inhibits expression of pluripotent cell markers. Second, forced expression of SoxB1 in the neural crest downregulates specific neural crest markers. These results are consistent with their spatial expression patterns, but how do they affect the actual function of pluripotency, i.e. the ability of cells to differentiate into multiple lineages? Here, they used explant cultures of blastula cells and measured the induction of mesoderm markers over time. Overexpression of both SoxB1 and SoxE factors inhibited mesoderm differentiation, but this appears to be a concentration-dependent response, as both SoxB1 and SoxE factors could also rescue mesoderm differentiation in SoxB1 depleted explants. This means that both SoxB1 and SoxE can maintain pluripotency, but their expression is still spatially separated, why? The authors hypothesize that the different transcription factors prepare the cells to adopt different lineages, namely SoxB1 for neural induction and SoxE for neural crest, following their spatial expression patterns. Further utilizing their explant system to test functional differentiation, they are able to confirm this hypothesis. Only SoxB1 factors can rescue neural marker expression and only SoxE factors can rescue neural crest marker expression. 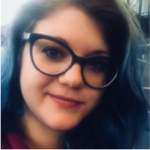 Why I Selected It – I started my career studying how cells move in the context of cancer cell metastasis. This field is huge and obviously very important to human health, but I think it collectively forgets that cells don’t only move when they aren’t supposed to. Developmental biology was studying how cells move in vivo long before it became a major target of various cancer therapies. We still have a lot to learn about when, why, and how cells move in vivo and this is why the neural crest is one of my new scientific loves. The neural crest derivates migrate huge distances in development, ending up at specific places at the end, not unlike cancer cells undergoing metastasis. If we can better understand how cells move in the massively complex context of animal development, maybe we can better understand how cells move in cancer. This is why I’m trying to learn as much as I can about the neural crest. Post-translational modification alters the function of SoxE factors. Is there a similar mechanism for SoxB1 factors? If not, could this specialty also contribute to why SoxE factors are necessary? Would you get different results if you block the post-translational modification of SoxE factors in your experiments? Is the somewhat overlapping function of SoxB1 and SoxE factors also represented in their sequence or structure similarities? Since the Sox family was created through many duplication events are these two sub-classes particularly closely related? For the in vivo rescue experiments, how severe are the defects? Can you still get a functional adult organism with early expression of SoxE or forced expression of SoxB1 in the neural crest? Takahashi K. & Yamanaka S. Induction of pluripotent stem cells from mouse embryonic and adult fibroblast cultures by defined factors. Cell (2006). 25;126(4):663-76. 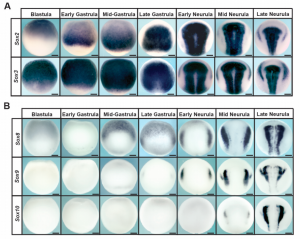 Buitrago-Delgado E., Nordin K., Rao A., Geary L., & LaBonne C. Shared pluripotency programs suggest derivation of vertebrate neural crest from blastula cells. Science (2015). 19; 348(6241): 1332–1335. Ariizumi T. & Asashima M. In vitro induction systems for analyses of amphibian organogenesis and body patterning. Int J. Dev Biol (2001). 45(1):273-9.